Submitted by Angarrack.info ... on Tue, 24/09/2013 - 00:00. 24 September 2013. Cornwall Council's Western Planning Committee approved the new fire station in Hayle with 13 votes in favour and 1 abstention. Hayle last had a fire station in the Second World War and that was closed soon after the war ended. Hayle has been fighting to reinstate it ever since. Few, if any, councillors favoured the Commercial Road car park site, but given the choice between there and nowhere, the support at Hayle Town Council was unanimous. In terms of response time, Hayle was badly served by the station in Camborne. Many opposed to the fire station on Commercial Road have pointed out traffic difficulties. Those same traffic difficulties were compounded when the appliance had to come from Camborne. 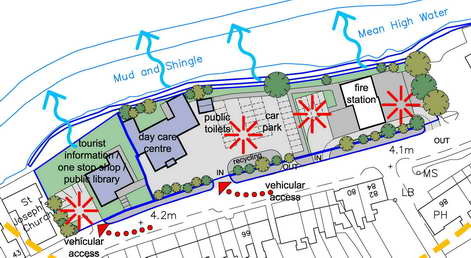 The current town council is trying hard to preserve what view there is left of Copperhouse Pool - but we were willing to give up a bit for something as important to the community as a fire station (and police and ambulance centre).